NBA Finals Rematch: Can Durant Beat LeBron This Time? 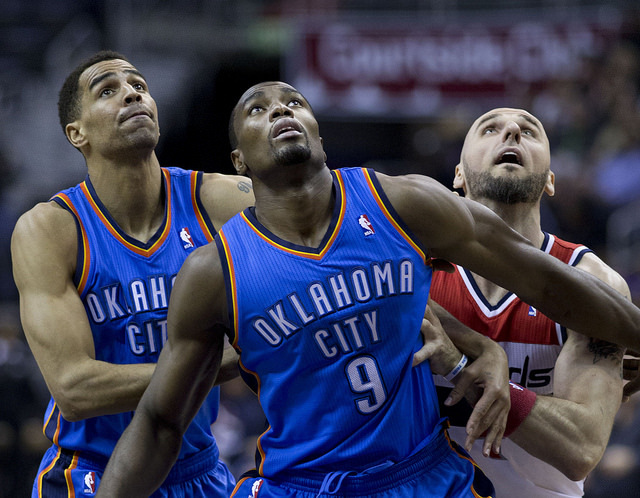 The Oklahoma City Thunder host the Miami Heat tonight in Chesapeake Energy Arena at 8 p.m. The game will pit the NBA’s two biggest stars — LeBron James and Kevin Durant — against each other for the second time this regular season. James has historically owned Durant, winning 13 of 17 games against Durant in the regular season and postseason combined. In the first reprisal of the 2013 NBA Finals on January 29, the Thunder thumped the Heat 112-95. 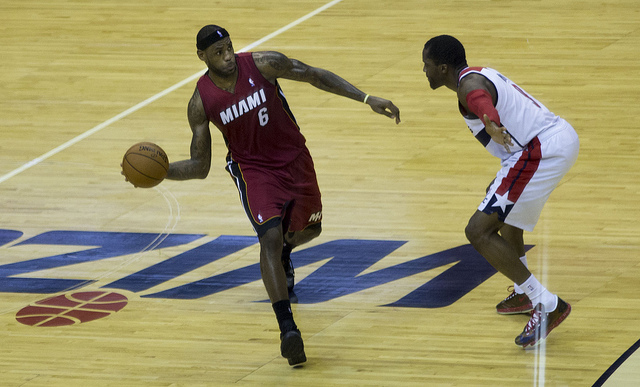 James led the Heat with 34 points, besting Durant by one. 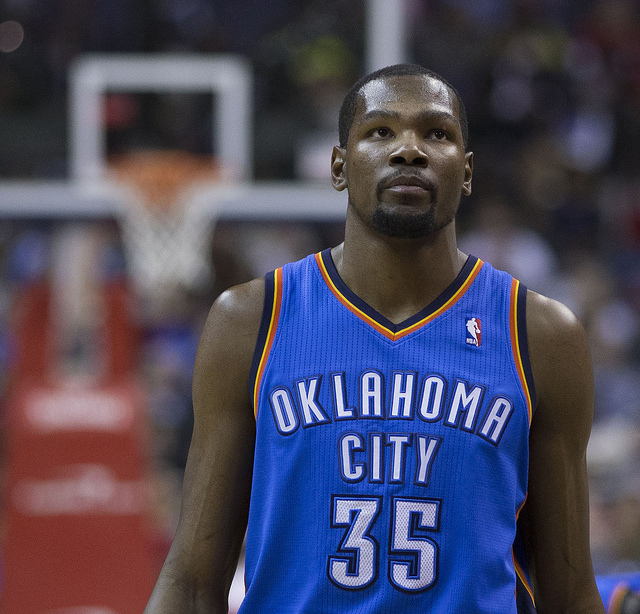 Durant scored 33 and added seven rebounds and five assists. Despite a fast start — Miami started out on a 22-4 run — the Heat fizzled and were dominated in the second and third quarters. It was just the fourth time Miami’s Big Three of James, Dwyane Wade, and Chris Bosh had lost after leading by 18, according to ESPN.com. The Thunder proved much better from 3-point range where they converted 16-of-27 (59.2 percent.) 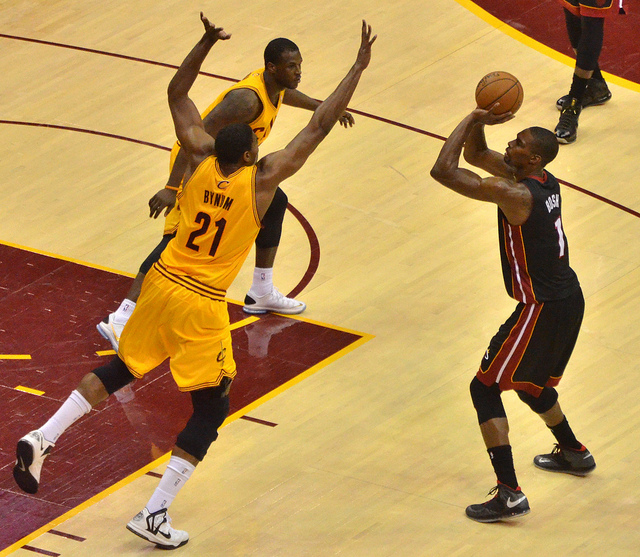 By comparison, the Heat shot a lackluster 3-of-19 (15.8 percent) from beyond the arc. Kevin Durant is the current favorite, according to NBA.com’s Race to the MVP Ladder. Let’s take a look at the stats to see why. Durant is currently averaging 31.5 points, 7.8 rebounds, and 5.5 assists per game through the first 54 games this season. His shooting percentages are 51 percent, 41 percent, and 8 percent from the field, from 3-point range and the free-throw line, respectively. The Thunder top the Western Conference at 42-12, including 20-7 since Durant’s co-star Russell Westbrook went down with a knee injury Christmas Day. James, who would become fourth player to win five MVP awards with a win this year, is currently averaging 26.8 points, 7.1 rebounds and 6.5 assists per game. His shooting percentages are 57 percent, 37 percent, and 75 percent from the field, from 3-point range and the free-throw line, respectively. The Heat are 38-14, trailing the No. 1-seeded Pacers in the Eastern Conference by two games. As much as Durant has shouldered the load with Westbrook out, James has carried his team in the last month, including a buzzer-beating 3-pointer to knock off the Warriors February 12. The biggest question facing James’s squad is whether Wade can stay stay healthy long enough to support a Heat three-peat. Wade has backed up James with 18.6 points per game. Miami’s defense has been criticized this season, as the age of Ray Allen, Shane Battier, and Wade could be taking a toll, but it hasn’t slowed down the Heat yet. Bosh could help put the Heat over the edge Thursday night if he can find his stroke against the Thunder’s bigger bodies at center. He made just 1-of-4 3-pointers against the Thunder on January 29. The Thunder also benefit from the defensive prowess of power forward Serge Ibaka, who protects the Thunder rim with ferocity. He averaged 15.7 points in Westbrook’s absence. Even the role players pitched in the first installment of this matchup, with Derek Fisher and Jeremy Lamb contributing 15 and 18 points off the bench against the Heat.